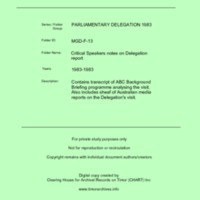 Contains transcript of ABC Background Briefing programme analysing the visit. Also includes sheaf of Australian media reports on the Delegation's visit. “Mass Media reportage [MGD F13],” CHART DIGITAL, accessed April 18, 2019, http://chart-digital.info/items/show/411.